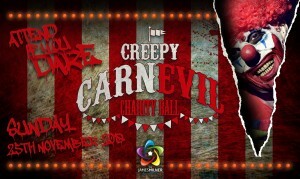 On the 25th November 2018, the James Milner Foundation (JMF) is pleased to invite you to our seventh annual charity ball, ‘Creepy CarnEVIL’ at Event City in Manchester. Are you brave enough to join us for a chilling evening of entertainment with surprises around every corner? Proceeds from the night’s event will go towards the work of the Foundation which aims to promote healthy recreation for the benefit of young people in the United Kingdom by the development, improvement and provision of opportunities in sports. The funds raised will also be used to benefit and promote national charities such as the NSPCC, Bloodwise and Help for Heroes. As usual there will be some fantastic acts that will be announced at a later date. Don’t miss out on this unique Charity Ball experience and a stand out superstar performance. You’ll have a rawr-ing good time! CLICK HERE TO VIEW OUR PACKAGES BROCHURE.